This entry was posted on Wednesday, May 28th, 2008 at 12:57 am	and is filed under Update. You can follow any responses to this entry through the RSS 2.0 feed. You can leave a response, or trackback from your own site. We are small group of English and Chinese volunteers in Cheng Du. Recently we have been traveling to those areas not completely covered by the rescue effort. We have spent time in PengZhou county delivering medicines and other necessities to small villages. We have funds, transport and until recently good information on where to go.However, now we are finding that information on isolated towns/villages is becoming scarce. This week we are planning to get out to DeYang or MianYang where the rural areas are still apparently short of certain items. contact me please. i have visited the hard-hit regions in mounatins during past twenty days. I have some contacts who can help u in the love relay race. 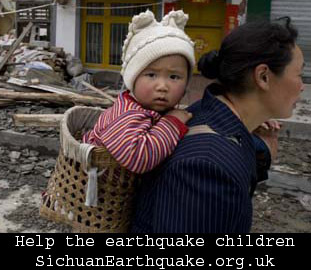 Many thanks for supporting Sichuan Children. As fujing replied, he should be able to pull out some local resources helping the delivery of the aids in particular to those isolated towns and villages in Deyang and Mianyang. I stumbleupon on a daily basis. It’s always exciting to read through articles from other writers and use something from other websites. Hello to every body, it’s my first visit of this webpage; this blog carries awesome and genuinely fine stuff in favor of visitors. duel, you will need your own armory which you can use to shed the perilous enemy.